Self-guided bike tour. Easy level ideal for families : only 20 to 40 km per day. The Bassin d’Arcachon is the only lake on the Aquitaine coast to be open on the Ocean. Twice a day, the water of this innland sea is renewed by the tide through narrow channels. For many years only frequented by fishermen, the Bassin d’Arcachon has become the kingdom of the oysters in the middle of the last century and its 84 km of beaches lined with pine trees make it an original and privileged place,unique on the French coast. 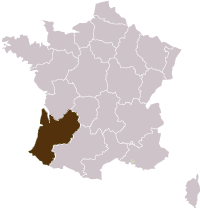 Bordered by the wild ocean to the West, Bordeaux vineyards to the North and East, and by the huge Landes Forest to the South, the Bassin enjoys a mild climate where the Ocean spray and the pine trees mingle. The quiet and temperate waters of the Bassin, where there are none of the dangers associated with ocean beaches and is very secure and pleasant. Through little ports with their coloured cabins, along the huge beaches, in the calm of nature, the birds reserves,this place is filled with the scent of sea air, the perfume of the pine trees, and mimosa and genêt shrubs. Arrive at ARCACHON, late afternoon. An internationally renowned seaside town, Arcachon was born during the 19th century from the imagination of daring pioneers who staked their bets on the popularity of seaside bathing. Come and discover this city, the winter town and sumptuous villas from the Second Empire, its churches, its walks alongside the Bassin and its port. Night in 3* hotel in Arcachon. Breakfast included. 2 OR 6 (flexible or depending on the availibility) : ARCACHON – LA DUNE DU PYLA – ARCACHON. 25 km. This step is not included in the 7 day trip. After breakfast, you will start your trip by cycling to the Pilat Dune, the largest dune in Europe with 105 meters high, 2700 m long and 500 m wide. The dune, formed recently (only 35 m high in 1855), is still not stable and moves towards the forest at a rate of 3 to 4 m per year. You can climb to the summit using steps or by a marked path. Follow beaches on a magnificent track and join the Pyla sur Mer then Moulleau, a suburb to the west of Arcachon, a very lively place in Summer with chic boutiques and trendy cafés. You will be surprised by the Notre dame des Passes Church, of byzantine style, built at the top of a sand dune by the Dominicans. It shelters the Lady of the Avent, one of the 3 statues in France that represents Mary pregnant. You then return to Arcachon and your hotel. Night in a 3* hotel in Arcachon. Breakfast included. ARCACHON – BIGANOS – ANDERNOS. 25 to 30 km Today you take the train from Arcachon to Biganos with your bike. From the station of Biganos, you rides towards the Port de Biganos and towards the Port des Tuiles. You continue towards Audenge and Audenge port where former basins are used as swimming pools. Following the dykes of the Graveyron estate, with its fish reservoirs, you reach the castle. Once you have enjoyed the splendid views over the Bassin and watched the many species of migrating birds, you come back inland towards Cassy port using a wide shady path, by following the “Domaine de Certes”.Gently cycling along the cycling track to Andernos Les Bains, a very pleasant seaside town.In the evening you can enjoy a number of activities: bars overlooking the sea, a walk on the pier or the beach, or go for a walk alongside Andernos to the Church St Eloi as far as St Brice port. Night and breakfast in a 2* hotel in Andernos. ANDERNOS – LE GRAND CROHOT – ANDERNOS. 37km A nice day in the large forest of Cap-Ferret: the pleasure to pedal in the heat, accompanied by the “cigales” song and the pine scent. You leave Andernos and pursue your circuit between ocean and forest, along the fine sandy beaches where the ocean gives birth to impressive waves. After a well deserved bathing, leave the beach and take back the road through the forest to join Lège-Cap-Ferret, then Ares, and finally Andernos. The vegetation is different and replaces the forest of pines along the Ocean. You can make a stop at the Resin collector House, an interesting place not to miss. You cross the Oyster-farming port of Ares and continue then your trip towards the beautiful Saint Brice's site that mixes forest and natural bank of the “Bassin d’Arcachon”. Night and breakfast in a 2* hotel, in Andernos. ANDERNOS-LES-BAINS – LE CAP FERRET–ARCACHON. 30 km Cap Ferret separates the Atlantic Ocean to the West and the Bay of Arcachon to the East, offering an original geographical location to observe the Pyla Dune and The “banc d’Arguin”, the waves and the limitless “Côte d’Argent”.Leave Andernos and join the hamlet of Jane de Boy, then take the track to discover the famous oyster fishing villages of Herbe and Canon. This leg of the peninsula is enchanting: preserved nature, the panoramic view while leaving the fishing village takes your breath away! Take the time to absorb it all: the bird island, Arcachon in front and the Dune of Pilat... magic!. Don’t forget to visit the Algerian chapel at Herbe... You leave Cap Ferret and cross the Bassin to return to Arcachon and your hotel. Admire the sandbank « le banc d’Arguin » in the middle of the channels, the Bird Island and the famous wooden cabins on stilts. Return to your hotel. Night in 3* hotel in Arcachon, breakfast included. 6 or 2 : ARCACHON – LE TEICH – ARCACHON. 40 km Leave Arcachon and take the cycling track via the Port of La Teste. Follow the “7 oyster ports of Gujan Mestras” a small road that runs round the bay alongside the railway station. You arrive at the oyster port at LaTeste, the port of Rocher passing by the “Salt fields”, vast expanses uncovered by the sea and only covered up during Spring tides. It’s home to a special vegetation, refuge to a variety of fauna: crabs, shellfish and crustaceans, which birds are fond of! Enter Gujan- Mestras, capital of oyster fishing which boasts no less than 7 ports dedicated to oyster farming. Discover its ports and these specific wooden cabins along the channel where flat-bottomed boats and a few “pinasses” are parked…A few marshes with curious shelters dedicated to water game hunting, before reaching the Teich bird park. The site offers various landscapes, from forests to prairies and lagoons. You will see many different bird species including swans, grey herons, little egrets as well as couples of storks. Return to the hotel at the end of the day. Night in a 3* hotel in Arcachon. Breakfast included. BIKE RENTAL : 75 OR 95 € per person depending on the period. 3 or 4 nights B&B in 3 star hotels and 2 nights in 2 star hotel. Assistance for the bike (for big damage), if bike booking. The train transfer from Arcachon to Facture (Biganos) – 4 euros. No need to book. The possible parking fee if arrival by car.